I had a dream when I left Dunedin for Auckland 9 months ago that I could be part of an urban community garden. We have finally managed to achieve my dream. We now have a plot with the Sanctuary Community Organic Garden at UNITEC. This community garden is a haven for city dwellers who want to be a little more self sufficient and grow their own food. 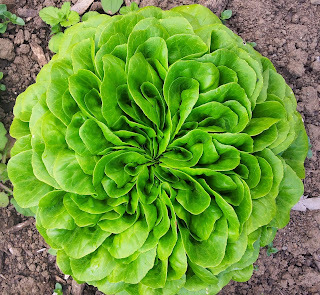 growing in someones plot - looks too good to eat! This tiny bit of self sufficiency gives me a good feeling, especially leaving behind a large food garden in Dunedin to living with one raised bed and herbs in pots in Ponsonby. We have nick named the community garden as "The Good Life Gardens" re-living the late 1970's comedy "The Good Life". Peter is not as fanatical as Tom in the TV series, but loves the physical work involved in gardening. 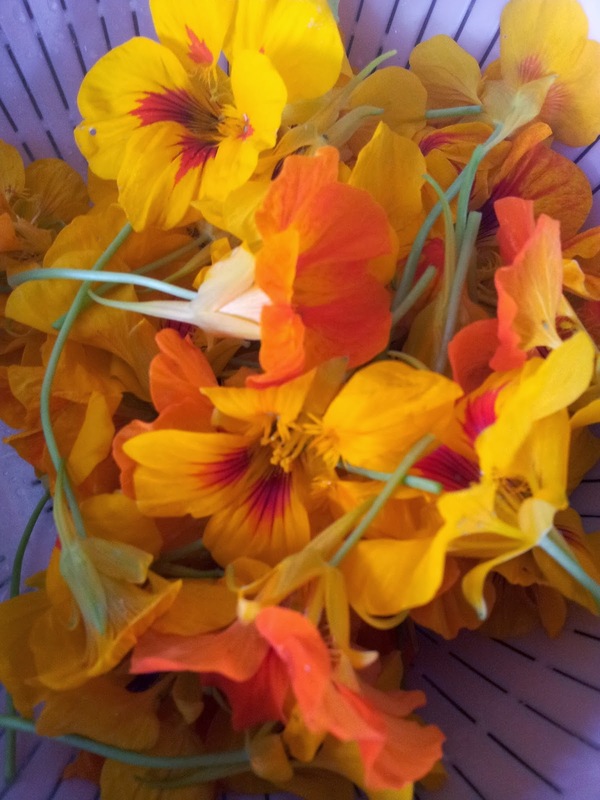 For me, it is a chance to share ideas and learn from local gardeners about what to plant and when ... and how to deal with a host of pests we just don't have down south. The gardeners tell us the volcanic soil here in Mt Albert is some of the best in New Zealand (certainly the free loam is a change from the clay in Dunedin). The soil has also benefited from being an organic garden for over 15 years. 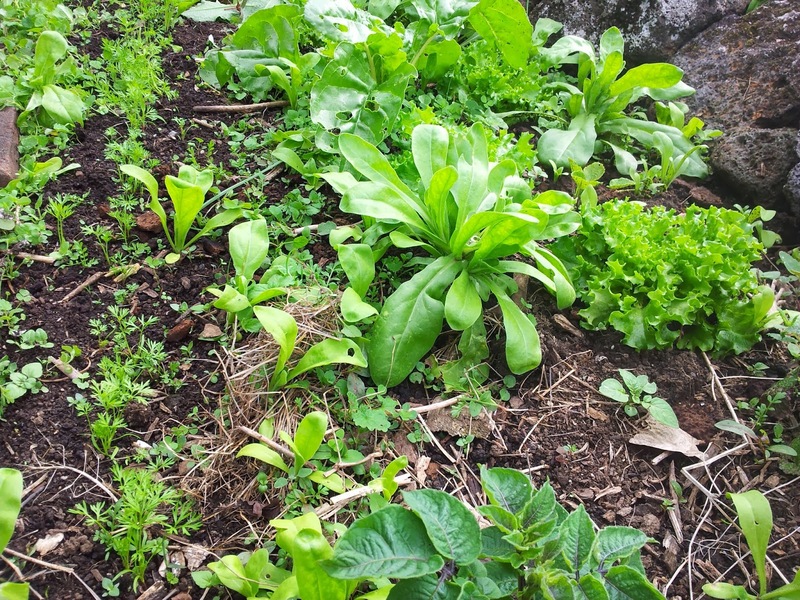 We have leased a plot about 4 x 4 metres amid the other family plots and the large communal beds of garlic, potatoes, silver beet and broad beans, plus beds of perennial herbs. 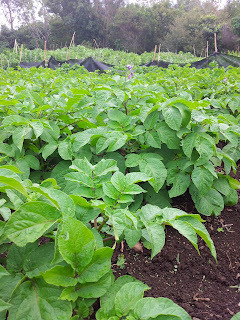 A very healthy potato patch. all our potatoes... and this should ensure we get a bumper crop. 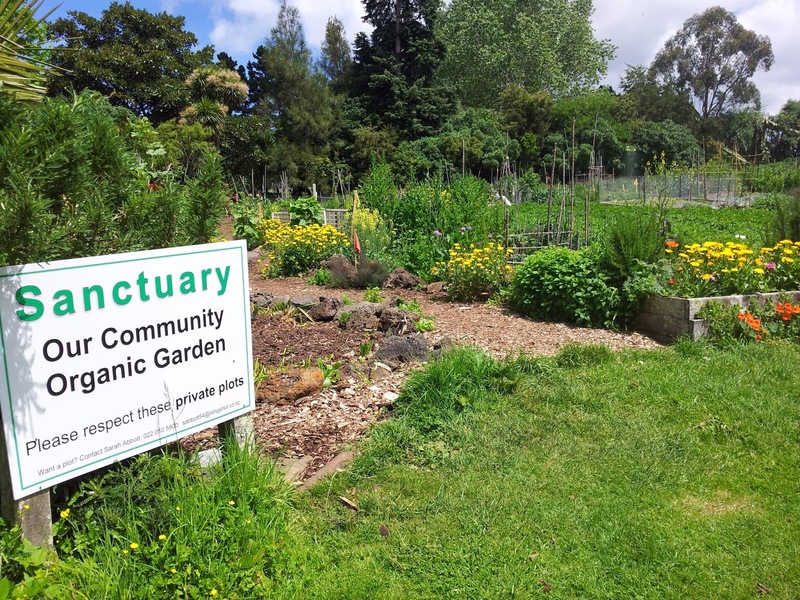 One of the founding members of the Sanctuary Trust was a Permaculturalist who planted up a food forest around the edge of the garden. Beyond that is a forest reserve so it's a perfectly sheltered site. 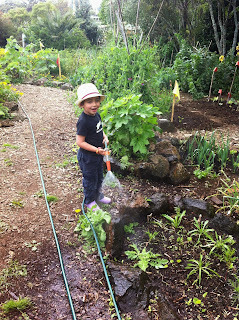 Permaculture is a philosophy as much as a method of gardening. It was first introduced to the world by Australian Bill Mollison who studied forest ecology and translated it into a system of growing food and crops in a sustainable way. If you want to know more take a look at A Beginners Guide to Permaculture Gardening, a video made in North London. There are small gardens in and around the plots that are planted in flowers to attract beneficial insects. Just as bees are essential for the success of the gardens, so too are Sarah, Bev and Trevor who organise us all. There are young and old gardeners, some experienced and others garden rookies. Being part of the community means promising a couple of hours a month to work on communal spaces. 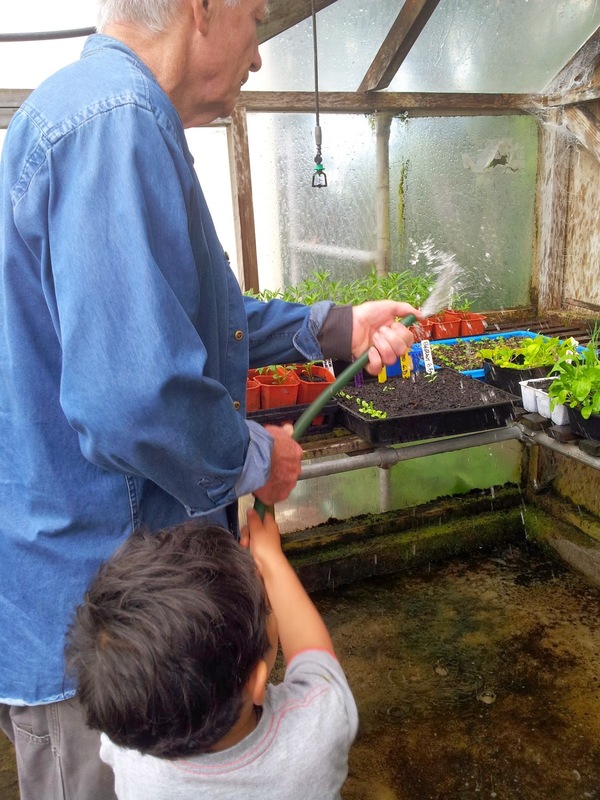 watering flower seedlings planted out on community work day. After our work, we retire to the large garden shed for a shared lunch around a large a central table. This is also an opportunity to chat and get to know our fellow gardeners. 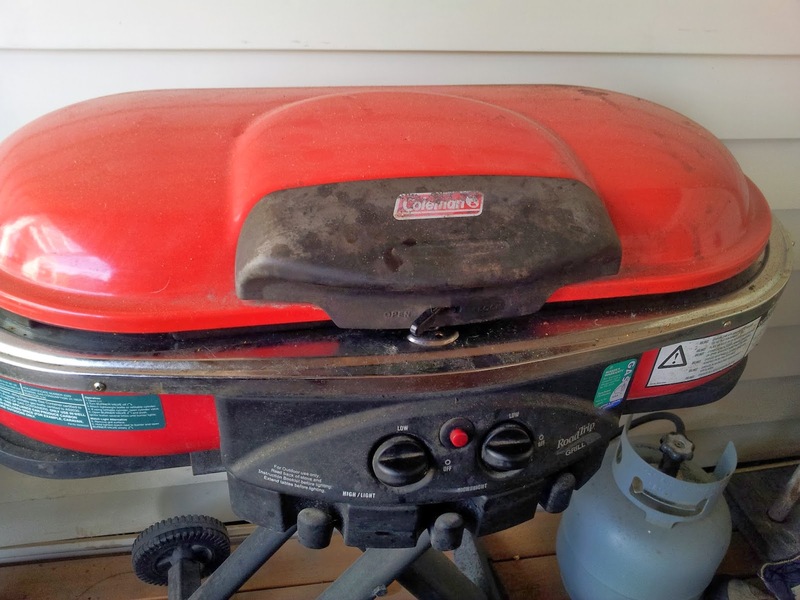 As a newbie to the group I felt a little nervous as what I should bring to our first shared lunch. I decided to make Baba Ghanoush and flat bread as this is one of the easiest and nicest ways of eating the gorgeous aubergine. Plus, as a dip it can go a long way. Aubergines are abundant and reasonably priced at this time of year. chopped parsley, a slurp of olive oil and a few nasturtiums to bring colour to the dish. 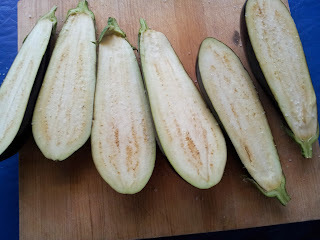 You can prepare the aubergine two different ways. I like to prepare them in halves. Sprinkle with rock salt, sit for 10 minutes, turn over and knock off salt and place face down on a tray (ideally lined with baking paper). are soft when you push down with your finger. recipe ideas for this versatile and healthy vegetable. 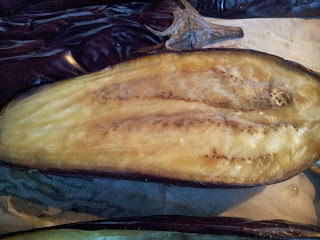 I was reminded of a simple and quick way to cook the aubergine for a baba ghanoush by my friend Jan this weekend. Jan pricked their skins and gave each aubergine a spray with oil before placing them on the hotplate of her compact barbecue, shutting the lid to keep the heat in. She turned them two or three times and after about 10 minutes took them out and placed them into a brown paper bag until cool. You can also cook them whole like this in an oven but it will take longer than on a barbecue plate. The end result whatever way you cook the flesh must be a soft flesh that can easily mash. 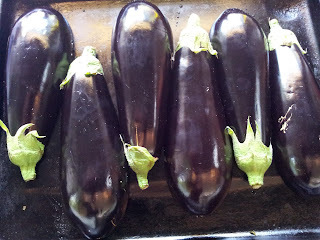 - great for eggs and worked well on the aubergine. The flesh looks a little like mashed ripe banana (and not particularly appetising yet.) 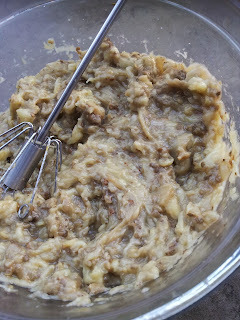 Next you add 2 Tbsp of Tahini (sesame seed paste). You can replace the tahini with peanut butter or one of Ceres Organics other nut spreads. I have discovered that Ceres produces a number of butters made from nuts. The one in this picture is called ABC - Almond, Brazil and Cashew. If you want it more creamy you could add in some thick yoghurt. If you want more of lemon zing, you could add more lemon juice and even a preserved lemon quarter, scraped and finely chopped. If you want more middle eastern heat then add some harissa paste. 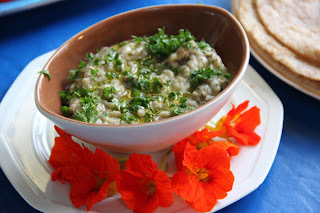 I used chopped up parsley but coriander with a little mint is also a great option. It's truly simple to make, but remember to taste as you go. Always add a little of any added flavour at a time. You don't want to overpower your dip with too many flavours. Aubergine is the perfect carrier of flavours, so why not give it a go. Experiment to find your own take on Baba Ghanoush. My version was a huge hit at the shared lunch. As the weather warms baba ghanoush can be part of a lovely lunch or light dinner if you add salad vegetables and toasted flatbreads. 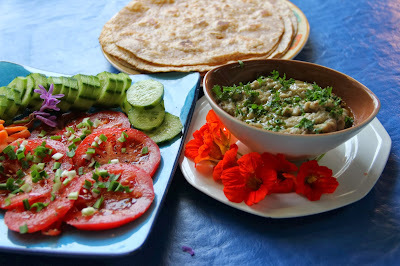 Tomatoes go particularly well with baba ghanoush. 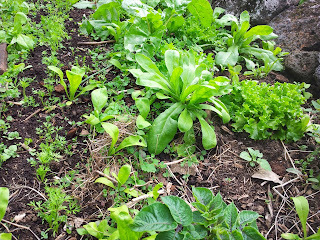 our patch in true permaculture style, by pulling the weeds and laying them down to eventually become part of the soil. We hope this will also help to keep the moisture in as we only visit the gardens once or twice a week. We do take out the invasive weeds. They are put into the community large plastic tanks with water to rot down and to be returned to the land as a tea. There are not many community gardens that also have a large greenhouse in which to raise seeds. I am doing an experiment to see which of my basil seedlings do best, the ones at home or those at the gardens. The basil at the "Good Life" gardens will have a good start in the greenhouse.